Which of our bands are you interested in? 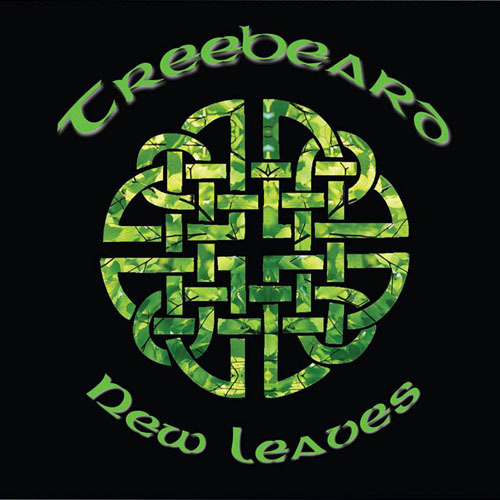 New Treebeard CD "New Leaves" out now! Contact the band via email! Get tickets for our show with the fantastic Mother Of Crows and exciting new band Morrigan's Fire at the Shakespeare, Gibraltar Street, Sheffield S3 8UA on Sunday 10th December. Advance tickets only £5 from Skiddle. First band onstage 8pm. A great venue with some fine real ales! Plenty of festivals under our belt this Summer and plenty more to come, the CD 'New Leaves' is selling well, so if you haven't got one yet you can pick one up here, and our new T-shirt has just been ordered! Featuring the Treebeard & celtic knot logos from the CD on the front and the 'Summer of Festival Fun' list of festivals on the back, all in green on black shirts, it's available in S, M , L & XL as well as ladyfit S, M, L & XL £15 at the gigs, from £18 inc p&p on our Merchandise page. Finally, only 7 years after the last CD, we have a new CD out! It features 15 tracks; 13 originals and 2 traditional song. Check out here for more details. 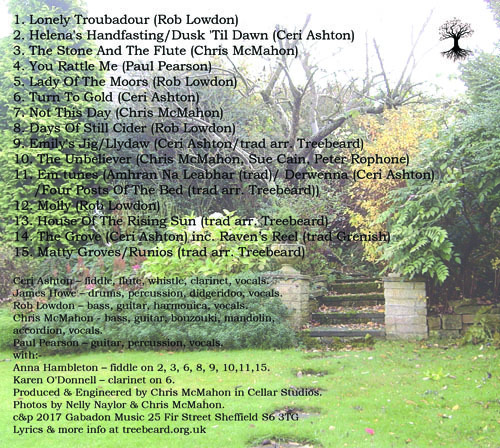 We'll be launching the CD at the Cross Scythes, Derbysire Lane, Sheffield on Friday 28th July. Lots more gigs coming up, including some exciting new festivals, so check out the gig list. You can tell when we're busy - the website stops getting updated! Too many gigs to even imagine, including loads of festivals, check the gig guide for the latest updates. We've just done a video for Rob's song 'Lonely Troubadour' for the 2weeks2 make it video competition, watch it here. And the new CD is getting very close, I hope to announce a release date in the next few weeks! Lots & lots of gigs this month, Red Deer (12th), Porter Cottage (20th), Maida Vale (25th), Forest (26th), Shakespeare Anti-Fracking Benefit (27th), then Haiti Benefit at St John's, Bamford (4th Dec) & DogFest, Black Market, Warsop (16th). That should break the new line-up in nicely! Sign up to our mailing list (above) or check out the . Danny (drums) is off at Huddersfield University studying sound engineering, Paul (bass, vocals) is concentrating on our original progressive rock band Haze and helping Cat (fiddle, mandolin) cope with two small children (hello Hazel & Lilly! 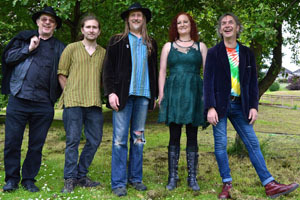 ), so have stepped back from Treebeard, leaving Ceri & myself to recruit good friends James (cahon), Rob (guitar, bass & vocals) & Paul (guitar, percussion & vocals) to keep the 'Heavy Wood' sound going! It's Tramlines time again! I'll be doing 8 shows in total (as last year), but only 3 with Treebeard, including a Saturday night headliner at the Red Deer, Pitt Street, others with Follow The Moon and new band The Mother of Crows. Full listings as usual here. We're doing a lot of shows with Ceri's new band Follow The Moon and Paul Pearson and Rob Lowdon. Check out the gig list at Gabadon Music! Lots of Treebeard gigs coming up this autumn, with a very special show featuring guests Paul Pearson and Rob Lowdon (Jabberwocky) at the Old Hall Inn, Hope on Sunday 29th November. Tickets are onsale now, £5 plus 50p booking fee from We Got Tickets. 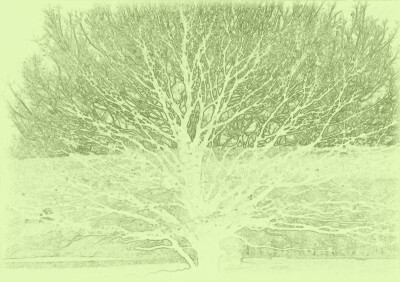 Treebeard play the rescheduled Sharrow Festival in Mount Pleasant Park, Sheffield S7 1BY on Saturday 22nd August 5.30-6pm. Admission Free. Despite some reservations about the whole Tramlines business model, we appear to have signed up for no less than 8 (eight!) gigs in the three days of the festival - 24-26th July. Full details are in the gig guide and on Facebook, and our full set (with Anna guesting on fiddle) is here. Well we had a great trip to Italy with Haze in October, check out the pictures here. I'm starting to book dates for the rest of the year, plus seriously thinking about doing a new album with the new line-up, let me know if you've any favourite tracks that we've not recorded yet? Email me here. Blimey, no updates for a year! Of course it's not that there's nothing to report, simply I've been too busy to update this page! Danny is now established as full time permanent drummer with Treebeard, and we've been starting to think about whether it's time for a new CD. We're playing on the Folk Train on Tuesday 26th August, the Anglers Rest, Bamford on Friday 12th September and Rossington Beer Festival, Doncaster on Saturday 4th October. We're back at Chesters, Chesterfield this Saturday, this time with Danny from Haze & The Outlandish Knights on drums, so expect a harder rocking sound & maybe more originals than usual! The new Haze CD 'The Last Battle' is finally out! Available through Amazon and direct from us a Gabadon, we think it's great, but why not take a listen to some edits of tracks at Reverbnation. Paul Chisnell announced his retirement from performing, due to increasingly bad tinnitus. His replacement in Haze & The Outlandish Knights is Danny McMahon. We're still working on the best direction to take Treebeard, but for now Trev from Jabberwocky & Broadsword will be playing percussion with us & we have our first public gig in a while at Chesters, Sheffield Road, Chesterfield this Saturday 16th February. Be nice to see a few of you there! been a bit quiet on the gigging front, Paul & Cat had a baby girl Hazel in November & I've been busy finishing off the new Haze CD "The Last Battle" out 25 March 2013, but we'll be back with Haze, Treebeard & The Outlandish Knights gigs very soon!